Support what you believe in. Think women should have more contests? Media coverage? Opportunities in skateboarding? Show it. Go to, watch, promote or at least tweet about the events that DO exist. Whether it’s a grassroots GRO event that has happened to come close to your town, or the women’s street contest at the X-Games, fan and participant presence makes a difference. No events going on near you? 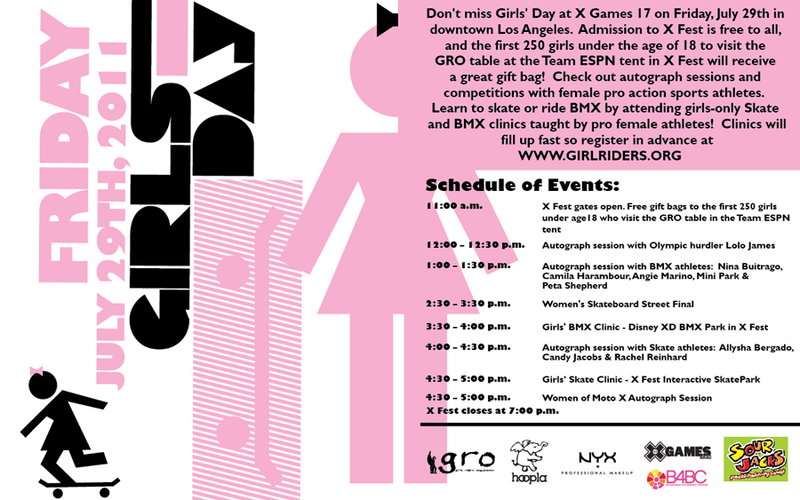 Buy from companies that support girl skaters and encourage others to do the same. Although it’s great that many people seem to want to see opportunities for women and girls who skateboard to grow, the companies that decide whether they want to include women’s divisions, sponsor women, make them pro model boards/shoes/etc. are most likely to respond favorably if they see an ACTIVE fan/participant base. Upset that Elissa Steamer and Zero have parted ways? Did you buy her board? With that said, it’s great that the dedicated women of street skating still have a spot in the X-Games. Show ESPN that they’re not making a mistake by keeping them in there. Show ESPN that you want to watch women skate. Go to or watchthe women’s street contest tomorrow. Leticia Bufoni with a front feeble.